LEGAL DISCLAIMER: his article is intended for audiences 19 years of age or older as it deals with mature subject matter. Please refer to the legislation and official resources of your jurisdiction for the use of cannabis products. This article is purely from the author’s experience and opinions, and is not verified official information. By continuing to read this article, you consent to absolving Dolled Up Desserts Gluten Free and Vegan Baking Inc. (Dolled Up Desserts), its founder Katarina Poletto, and all its subsidiaries of any and all liabilities and damages that may be caused by your personal use. 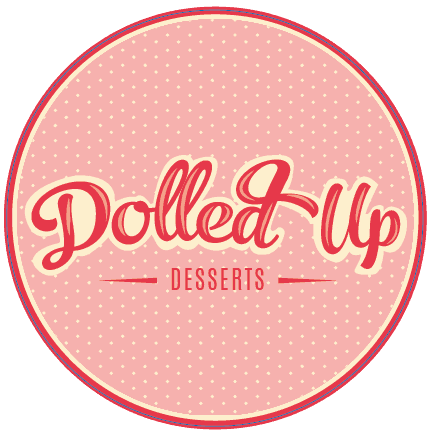 Dolled Up Desserts does not formally endorse the use of cannabis for the production of edibles, and cannot speak to the health related effects or safety concerns like a physician or lawmaker. We come from the perspective of providing safe use recommendations for Canadians and Americans living in legalized jurisdictions to make their own edibles for personal use only. We do not claim to be experts in the subject and are not prescribing any behaviour or use of cannabis. If you choose to use cannabis, please follow the legislation of your jurisdiction. Please do not operate heavy machinery, drive, take advantage of others, or allow persons under the legal age consume cannabis products. In 2018, the personal recreational purchase and consumption of cannabis was legalized for the mass Canadian (woohoo Canada!). Although there are many ways to enjoy cannabis, the experience that comes with edible cannabis is unlike any other. Edibles are considered a more inclusive and “friendly” approach to cannabis consumption (because eating a cookie is so much more fun than smoking, in our opinion!). From savoury rubs and sauces to brownies, “getting high” no longer requires you to inhale anything. Although effects are different for everyone, edibles also produce a significantly prolonged and heightened effect on the body and mind (up to 10 hours). As a vegan and gluten free pastry chef, my priority is to consistently innovate high quality, safe and inclusive experiences through treats. The legalization of cannabis has allowed Canadians the opportunity to produce their own cannabis edibles, which is a huge step forward toward the acceptance of cannabis in our society. However, DIY edibles are not a straight and narrow process, and if you do not have the prior knowledge or experience, your edibles could end up being anywhere from without effect to being seriously dangerous. Since I am all about inclusivity and safety, I have decided to share my take on vegan cannabutter, which can used in almost any recipe of your choosing that requires oil. I hope I can help make your experience with cannabis safe and accessible. 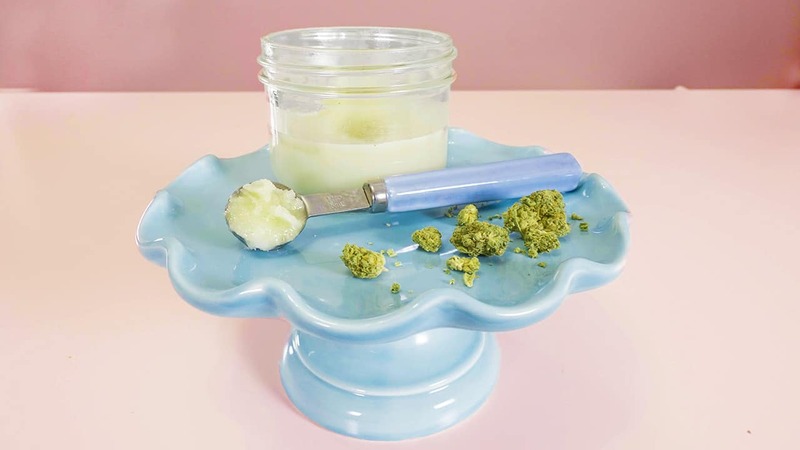 Make Cannabutter with Your Final Product in Mind: many online cannabutter recipes recommend infusing large amounts of cannabis into butter (7-8g), to which you can use a small amount in any recipe. I do not like or recommend this approach as you do not actually know how much cannabis has been infused into that portion you decide to consume. I like to make cannabutter knowing exactly what I plan to make and how many portions I want out of it. That way I can control the dosage and ensure that every edible I make ends up with the same amount of cannabis infused. 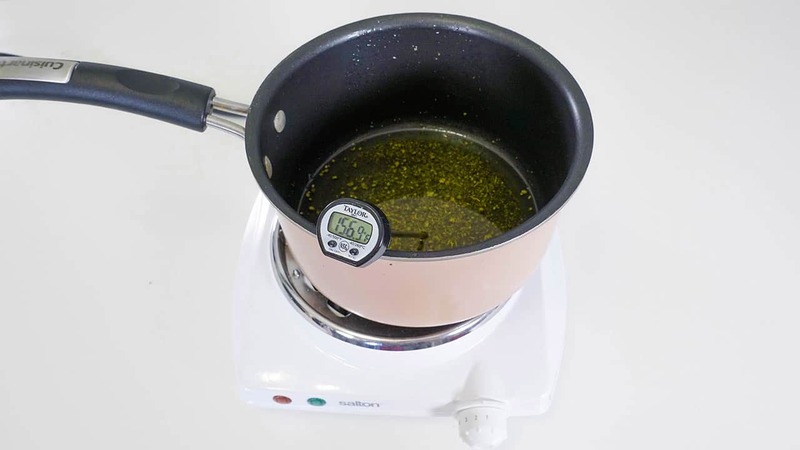 Precise Calculations: the first step in making edibles is buying a precision scale (measures to the 0.01g) and a digital candy thermometer. You should be measuring everything to the milligram to ensure safe and accurate dosing. Thus a scale is essential. A thermometer is critical during the infusion phase to ensure your hot butter doesn’t scald the cannabis bud. Continuing my previous point, it is essential to calculate AHEAD OF TIME how much cannabis you would like to have per serving. In Canada and almost all legal US States, the proposed legal dose of an edible is 0.01g, or 10mg. If I was planning to make 36 infused cookies, and my recipe calls for 80g of butter, I would multiply 36 servings by 0.01g. This is the total cannabis that I need to infuse into my butter, which in this example equals 0.36g. In reality, this is not a lot of cannabis, thus being a great place to start for first time users. At your own personal discretion and risk, you can increase the dose per serving. Other factors in the production process, from cannabis strain to how long you infused the butter, will increase or decrease the potency of the edible. Above all else, it is important to follow the first golden rule, and be sure to set boundaries for your own comfort zone. Whether you are plant based or not, coconut oil is one of the best oils to infuse with cannabis. It’s heat capacity is the highest of almost all oils (400 F), does not change consistency or texture when heated (unlike margarine), and best retains the cannabinoids due to having the highest concentration of fatty acids. Other oils like canola or sunflower will work, but will not retain the same amount of cannabis as coconut oil. You may need to adjust your dosing based on personal preference. When it comes to the cannabis itself, not every cannabis plant was bred and grown equally. The world of cannabis is incredibly diverse. Over thousands of years, cannabis has been innovated naturally to produce countless of positive health benefits, tastes, and sensory experiences. Research your cannabis (Leafly is a great resource) before you buy cannabis legally from your provincial or state regulated cannabis store. Regardless of your selected strain, you are going to need to ensure you fully extract the naturally occurring compounds into the butter. The THC, CBD and all compounds are chemically activated with heat (hence why cannabis is traditionally smoked or vaped). For edibles, we need to mimic this process or else our infused cannabutter will not contain any cannabis. Thus, the first and most important step is to toast your ground cannabis to activate the THC through a process called decarboxylation. In short, this is just a fancy chemistry word for toasting. There are two common infusion methods. The first way, which is what is detailed in the recipe, is the quick and simple way. You mix your decarboxylated cannabis bud in a small saucepan with the melted coconut oil and let it steep for 4-6 hours on the lowest heat setting possible that your stove top provides. Once infused, you use a fine mesh sieve and strain out the cannabis, leaving behind fully infused butter. This process is hassle free, but you also need to keep a closer eye on your cannabutter as it infuses. The ideal infusion temperature is between 180-200F. Above 200F you start to scald the THC. However, if it does go over temperature, it’s not the end of the world. Take the pot off the burner, let it cool down and put it back on the heat again at a lower temperature. The second method requires more tools, but will not scald your cannabis as easily. Instead of mixing the cannabis straight in with the coconut oil, you put the grounds in an empty tea bag to steep in the oil. Instead of being in direct contact with the sauce pan, your oil will remain in a glass jar that you plan to store your cannabutter in. This jar gets immersed in water that is being heated consistently in the sauce pan. The water bath will consistently heat the oil, and you no longer need to strain the cannabis post infusion. Either method works well, just ensure you keep temperatures low and infuse slowly. If you’re a visual or auditory learner, or would just rather watch this content, check out my video on the Dolled Up Desserts youtube channel with Lisa Le from The Viet Vegan . We discuss all of this and more. Cannabutter is the base to any infused cannabis food product. This recipe is a low dose, safe way to experiment with your own homemade vegan edibles. You can adjust the servings based on your needs, please refer to the full article for details on how to do this. Preheat oven to 245°F. Line baking sheet with parchment paper. 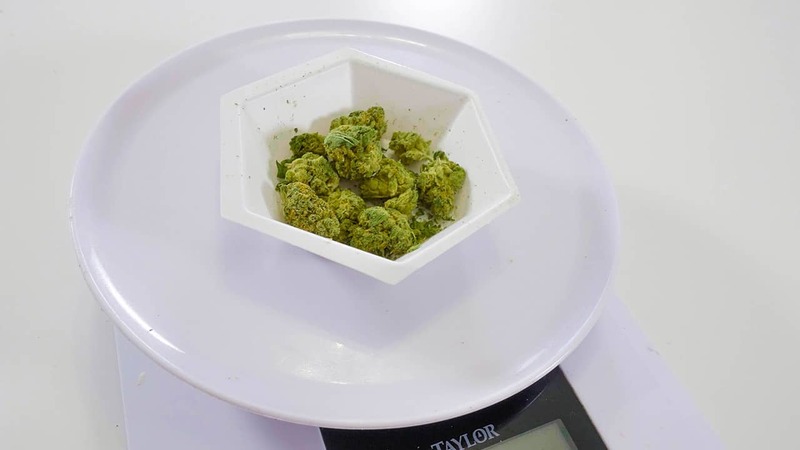 Using a precision scale, weigh your marijuana based on your calculations per dose. 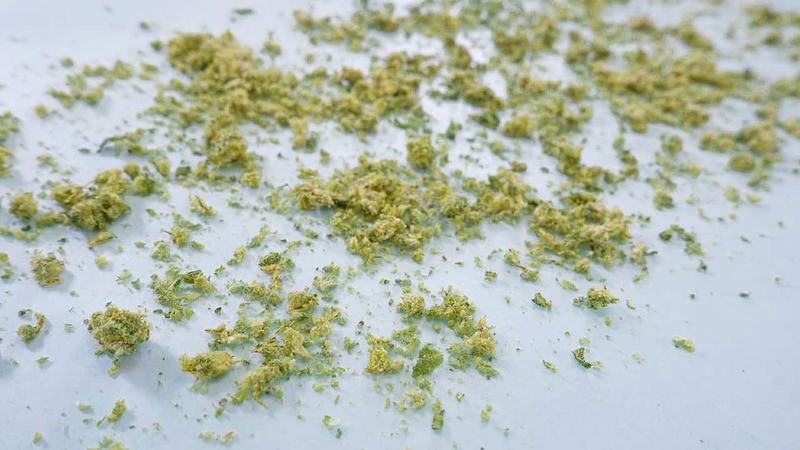 Place marijuana buds in grinder and grind completely. Remove grounds and spread evenly on baking sheet. Bake for 35 minutes. Be sure to turn on your exhaust hood if you do not want your kitchen to smell like cannabis. Once your marijuana has toasted, in a small saucepan on low heat, melt coconut oil. Mix in ground marijuana. Once melted, turn the heat down to the lowest heat setting possible, place candy thermometer in the oil. Let infuse for 4-6 hours, depending on how much time you have. NB: The optimal infusion temperature is between 180-200°F, however if it goes under or over this temperature, do not worry. Heat up or cool off the butter by turning up or turning off the heat. Once time has passed, pour the infused butter through the fine mesh sieve into the container of choice. Gently press the marijuana left behind using as spatula to ensure all butter has been extracted. Throw away the grounds. Store cannabutter in a sealed airtight container in the fridge for up to 6 months or in the freezer up to one year.